In the world of GM racing, there are few names as well-known as NASCAR owner Rick Hendrick and in addition to owning some of the most successful teams in the history of American stock car racing, he also owns a handful of Chevrolet dealerships. To draw even more attention to the 2016 Chevrolet Camaro, Rick Hendrick’s team has designed a graphics package for the 6th gen muscle car that sports the name of the NASCAR legend. This information comes to us from the CamaroSix.com Facebook page, which shows off the unique Rick Hendrick Edition 2016 Camaro owned by CamaroSix member Chris Martin. The 2016 Camaro SS customized by the Rick Hendrick Chevrolet team doesn’t pack any extra performance, but it does add a great looking graphics package – as shown above. This includes the red-trimmed black stripes which start around the headlights, flowing back along the upper body line and ending in the rear pillar. There are also matching dark accents in the lower front fascia opening, along with added black trim on the rear spoiler and across the entire roof. On Chris Martin’s white Camaro SS, this package really looks incredible, especially when combined with the black hood vents and the black wheels. Information on ordering one of these customized 2016 Camaro units is short, but provided that the availability is limited, this is the kind of package that could carry extra collectable value in the future. Similar dealership packages have proven to be popular with collectors and with this being one of early issue 6th gen Camaro SS coupes while also being fitted with the unique graphics package – this Camaro is likely to stand out in a crowd of similar muscle cars. 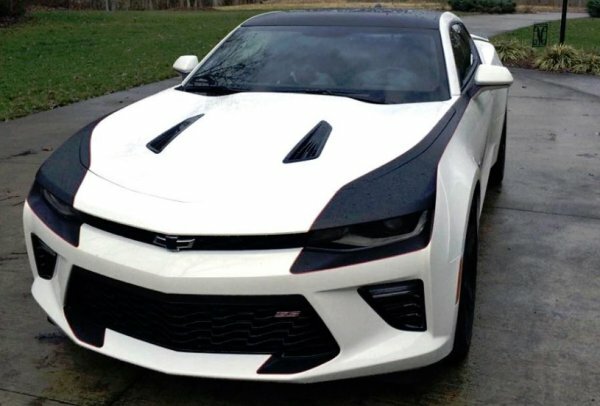 As is the case with any appearance package, some people on the CamaroSix Facebook page aren’t loving the look of the Rick Hendrick Edition 2016 Camaro SS, but I like it, the owner obviously likes it and enough others on the page are liking it that I expect to see more of these cars showing up online over the next few months. Click here to see a collection of images of the Rick Hendrick Edition 2016 Camaro SS on the CamaroSix Facebook page.